Home / Columns • Lindsay / Nicole Curtis Goodness! Lindsay Heads To World Market To Meet The Home Improvement Star! Selfies! Autographs! And More! How much do I love Linds? I mean I adore her. I love it when she texts me random things, I love it when I read her site, which of course is I Am Not A Stalker and if you haven’t checked it out, you must be living under a rock! But I love it the most when she sends in an article for us here at MTF! Of course, after she sent in her article I totally spaced and it took me forever to get it up and running. So sorry my love! 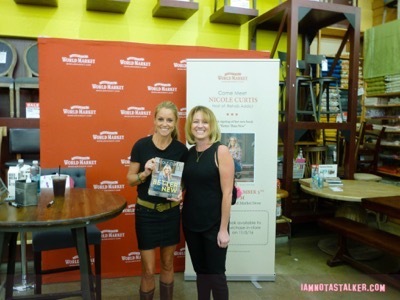 Linds had an awesome time at a recent book signing for Nicole Curtis who was making an appearance at World Market. Check it out below! My name is Lindsay and I’m addicted to Rehab Addict. It’s likely that some of you (I’m looking at you, Mikey!) have no idea who I am talking about. Others just have to hear the words “Minnehaha House” and they start drooling. I’m in the latter camp. 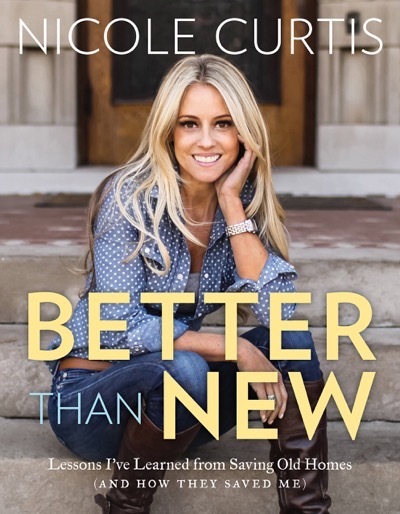 My parents introduced me to the DIY/HGTV home renovation series via a binge-watch in early 2014 and I was immediately taken with both the show and its spunky star, Nicole Curtis, who has a passion for restoring dilapidated old homes to their original glory. Not only are Nicole’s design ideas top notch, but I love that she does virtually all of the work herself. And the woman has some amazing style. I’m not gonna lie – I tune in to the show just as much for Nicole’s clothing as I do for home renovation inspiration. 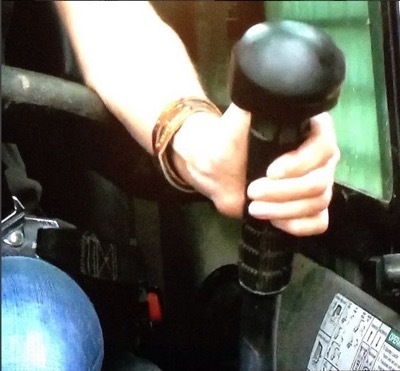 During that initial watch of Rehab Addict with my parents, I became immediately taken with a wraparound leather bracelet I noticed Nicole wearing in virtually every episode – so taken that I had to pause the show to do some investigating on my iPhone to track said bracelet down (yep, I stalk more than just locations!). 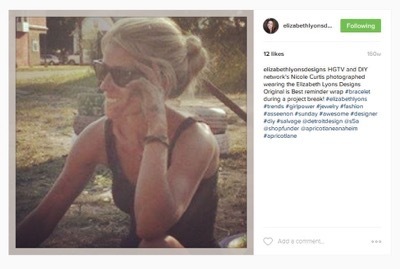 It did not take me long to find the jewelry designer, Elizabeth Lyons (thank you, Instagram! 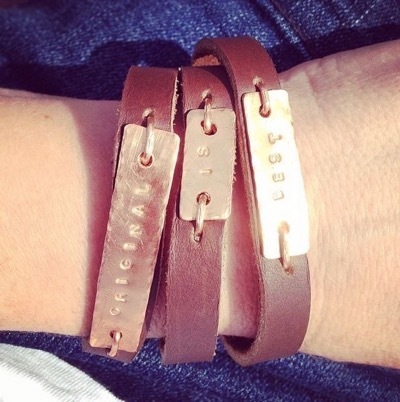 ), as well as the bracelet I so coveted – a thin leather piece with the words “Original Is Best” stamped on attached copper tags. It is Nicole’s philosophy that all original elements of a house should be left intact, hence the phrasing. I sent the designer’s info to my husband, who was away on business at the time, with the comment “In case you’re looking for gift ideas for me . . .” Though the pieces are typically custom made for customers with sayings of their choice, I informed him that I wanted “Original Is Best,” just like Nicole’s. (Miss Pinky Lovejoy of the Thinking Pink blog was quick to tell me how unoriginal that actually was.) The email was sent a bit in jest as my husband does not like to spend money (I call him the Grim Cheaper aka the GC), so imagine my surprise when just a couple of weeks afterward I was gifted the bracelet for Valentine’s Day. I later wrote to the jewelry designer to tell her how much I loved the bracelet and she was flabbergasted to learn that I had noticed it on Rehab Addict, especially considering how many other pretty things there are to look at in each episode, and then tracked her down via social media. And yes, I’m fully aware how crazy the whole thing makes me sound – but that’s how obsessed with Nicole and Rehab Addict I was straight out of the gate. I still wear my bracelet regularly and have since gotten the GC hooked on the show, as well. Prior to Nicole’s signing, I had never attended a celebrity event at World Market, so I was not sure what to expect. I have to say it was the most well-organized, stress-free, and pleasant event I’ve ever been to. Whoever came up with the schematic that the chain uses for these sorts of things deserves a huge pat on the back. The way it works at World Market is as follows (and from the employees I spoke with, this is the method at all of their stores) – when you arrive, you purchase a book (or whatever it is the celebrity will be signing) inside the store. You then head to the events table outside where you are given a numbered card. The number denotes your position in the signing line. At that point you can either go get in line outside or you can walk around and shop and get in line later in your numbered order. Due to the organized plan, people in line were calm, easygoing and pleasant. There was no cutting, no pushiness, no hostility. Amazing, right? And unlike any other signing I’ve ever experienced. Barnes & Noble at The Grove has the worst system of them all, which involves fans having to get to the store before it opens (typically hours ahead of time) in order to line up for a lettered wristband and then having to come back (again, typically hours ahead of time) for the signing later that evening. During big signings, lettered groups are scattered throughout the store and this results in cutting, major disorganization and haphazardness in general. I won’t even get into the time that employees forgot to call my particular lettered group, causing us to wait a good two hours more than we should have and almost miss getting our books signs altogether. Yep, disorganization is the name of the game at the Barnes & Noble at The Grove. It has come to the point that I only go to signings there for a celeb that I really, really, really love and even in those scenarios I decide against it 99% of the time. Then there’s Vroman’s (a store that is actually one of my favorite places in the world), where you do not need to show up in the morning for a wrist band (thank the good lord!). Fans simply arrive in the evening and take a seat in the signing room. Where you sit denotes where you will later stand in line to get your book signed after the celebrity speaks. Where Vroman’s falters is that they wait to decide whether or not to give out numbered tickets based on how many people turn up to the event. So, if 50 people turn up, no numbered tickets. If 150 turn up, at the last minute, they’ll start handing out tickets. So just imagine, you have 150 people sitting in the signing alcove and all of a sudden an employee announces that fans will now need a numbered ticket that will denote their place in the signing line. Yep, chaos ensues with everyone abandoning their seats and rushing to the employee, who gives the tickets out haphazardly with no concern for who actually has been there the longest. And while I’ve never been to a signing at Book Soup, Pinky has and said it was just as terribly run. I don’t understand why no one, outside of Cost Plus, can get it together. I mean, it’s not rocket science. Oh, and here’s the kicker about Cost Plus. You do not actually have to purchase anything at one of their signings! Yep, you read that right! In the case of Nicole’s signing, fans could simply show up, get a numbered card, wait in line and then pose for a photograph with the star, sans purchase. Those who wanted an autograph, but did not want to purchase a book were given a free headshot of Nicole provided by the store that she would sign! As one employee explained to me, “This isn’t about making money for us, this is about the fans.” Say whaaat? And that is apparently typical of all of their events. Oh, and the signing got started on time, to boot. Props, Cost Plus. Props. Once Nicole arrived, we were taken into the store in groups of ten to meet her. As each fan reached the front of the line, a World Market employee would take their camera to snap photos. The icing on the cake was how nice Nicole turned out to be. She really took her time with each fan, chatted easily, happily posed for photos, and asked questions. She is hands-down the most aware celebrity I’ve ever encountered. I’m sorry to say that many stars are self-absorbed. It’s kind of the nature of their business. But Nicole was not at all. As I walked up to her, I handed her the books I was purchasing and said how excited I was to be meeting her. She looked down at the post-it attached to my book on which my name was spelled out and said, “Wait, first things first, are you Lindsay?” I told her I was and she then asked me about myself while she signed. Then she opened the second book I had, which I was purchasing for Nat, and asked me who Nat was. Like, what? I have never had a celebrity ask me my name, let alone inquire about who else I was purchasing books for!!!! I told her that Nat was one of my BFFs, that I had gotten her hooked on the show, but that she lives in San Francisco, and was therefore unable to attend the signing. 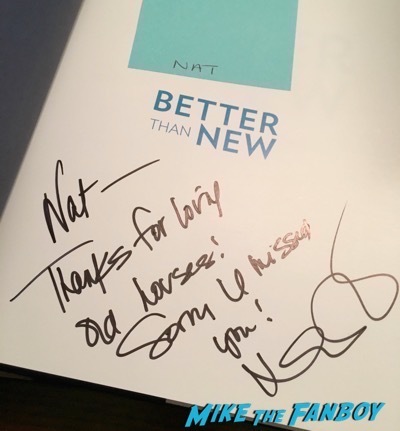 Nicole then signed her book, “Sorry I missed you!” See what I mean? She was just so incredibly aware and attentive. She also noticed the GC standing off to the side and asked if he wanted to take a photograph with her, as well. When I explained that he doesn’t like being in pictures, she started laughing and said, “Oh my gosh, I thought you were about to say that he doesn’t like me!” Again though, see what I mean? She was so aware of everyone and everything around her that she even noticed my husband standing off to the side. Best part – she asked me to check my camera to make sure my photographs had turned out OK before we said our goodbyes. Class act all around. All in all, it was a fabulous experience, so thank you Nicole and thank you Cost Plus! I don’t care who you have at your next signing! I’m in! The 2015 Year End Recap! Favorite Moments! Worst Encounters! Bumbling Moments! The MTF Writers Tell All! I am Lindsay’s mom. The reason I started watching it is because a good friend told me I HAD to watch as Nicole looked so much like Lindsay and they do look alike. (Lindsay used to have long hair.). So thanks Karie for getting us hooked!